The Challenge: Free Agents is bringing the drama! As the competition heats up, more and more drama is bound to happen, and some of it came to a head during this episode. Picking up from last week, a good majority of the house works out before the next challenge. It's clear as day from the confessionals that Johnny Bananas and Jordan DO NOT like each other, but I think it's partly because they're a lot alike. At the next challenge, T.J. presents to the competitors Piggy Back, which will split them up into two teams of 10. There are two platforms over water on the opposite sides of each other, with ropes to cross to get to the other side All ten players will start on one platform, using each other to piggy back across, basically climbing over each other to cross these ropes. Everyone also must have both hands on their ropes at all times. You need A LOT of upper body strength and endurance to stay alive! The house is split into two teams, Team Purple an Team Yellow, and the game gets underway!Team Purple is an absolute mess, unfortunately. They have no real system to get people across, only getting four of their players across. Obviously, since Team Yellow went second, they have a much better system, thinking to crouch down to use people as a step. However, they end up only getting four people across too, so it comes down to who has the quickest time! Team Yellow ends up getting the quickest time. 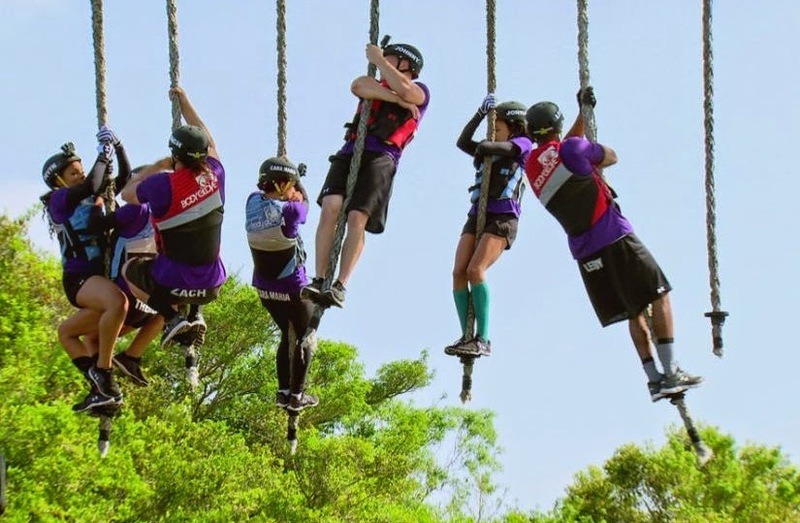 However, since Preston didn't touch the last two ropes with both hands while crossing, the Yellow Team gets disqualified, giving the win to Team Purple! At their team deliberation, Cara Maria feels like they should call out Johnny Bananas. Theresa herself wants to throw in Laurel, who's a strong competitor and her arch nemesis. When it comes down to it, though, Theresa doesn't actually vote in Laurel herself. She pulls a punk move, letting other people vote for her, without actually saying her name. Laurel and Johnny Bananas gets thrown in, after Jordan immaturely gives a short speech about how Johnny needs to "earn his stripes." Later, Devyn calls Theresa out for lying, and then tells Laurel that Theresa was the one behind getting her thrown into elimination. Normally, I'm not for snitching, but with this, I'm not mad. That's what Theresa gets for being a punk and trying to let other people do her dirty work. At the elimination, Jasmine and Isaac pulls the Kill Card to go against Laurel and Bananas. The goal is to score a basket in a barrel, with the opposing players alternating offense and defense over 5 rounds. If the ball or the player goes out of bounds, that round is over. Of course, Jasmine is upset because she knows that Laurel is TOUGH. The competitors get to play Balls In, which we saw in the season premiere. Jasmine's a fighter, but Laurel just pushes that little girl out of her way, sending Jasmine home. Johnny comes out swinging, easily sending Isaac home, and of course, he's coming back for Jordan fiercely! Back at the house, the two get into it, with Jordan saying that he's going to be the one to send Johnny home. I liked this kid last season, but he's too much now. He didn't even win last season or get to the final to be this cocky! I wouldn't be surprised if he got sent home within the next few weeks or so. Somebody needs to knock him down a few pegs! Check out all new episodes of The Challenge: Free Agents on Thursdays at 10 p.m. only on MTV!